With the dawn of each new year comes a chance for reinvention. Though so many people take this time to focus their efforts on the surface-level things – procuring more work, losing weight, finding love – their efforts tend to fall flat after a few weeks. That’s because this is a time for us to do the inner work and make choices that have naturally positive results in the long-term. If the idea of doing that kind of work on your own feels daunting, take heart: there are many opportunities to look for guidance, especially in the digital age. For instance, online therapy might be something to consider. There are apps that allow you to send unlimited texts and audio messages to a licensed therapist – and set up video calls for face-to face interaction – whenever needed. 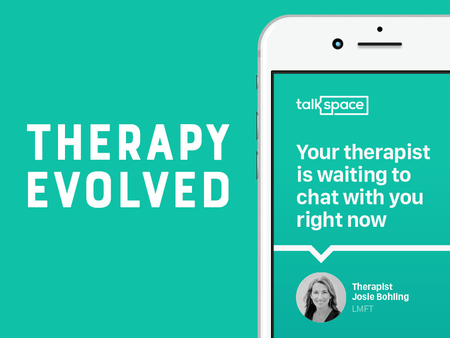 This new approach to therapy is not only super-accessible physically, but also financially: the app Talkspace only charges $39 weekly, whereas a typical in-person session can run you $150. Everyone has areas in which they could stand to improve, and utlizing online therapy can also provide greater self-awareness and a perspective that you just won’t get from friends. Here, suggestions for that one thing you should consider focusing on in 2018 – whether you do it alone, or with help. You know how people have an unconscious “love map,” as in, a series of traits or features that they don’t realize they prefer in a partner? Well, you should take 2018 to sit down and figure out what your “career map” is. The past few years have been tumultuous and raised some big questions about who you are and where you’re headed in life. Now is the time to decide where you want to be planted, and get to work tilling the soil. You should address longstanding relationship issues. As an inherently social creature, this will be the year that you’re at your best in love and friendship. This means that it is extra-important that you be fully aware of who you are giving all of that attention to. If there are ongoing relationship issues that you know you’ve needed to deal with for a long time, do it now. There’s no sense in waiting for the next blow out (or fall out) to address them. It’s time to identify what’s holding you back. You know you’ve had big plans and maybe even a few ideas for a new business that you want to begin. Despite this, it’s taken you a few years to even come to terms with really putting yourself back out there in the way that you want to. This is the year to address those fears, and to figure out why you’re not living up to your fullest potential. You should re-commit to your goals in a more serious way. Whether your aspirations involve a happy home life, a more well-developed business, or even just seeing friends more often, you’re going to need to sit down and make a serious plan of action. These things are not going to manifest themselves – don’t forget that you have the power within you. It’s time to regain the confidence you lost a few years ago. It might have been a breakup, a job loss, or some other kind of random anxiety that cropped up over the past few years, and it’s stayed much longer than it’s been welcome. This is the year for you to decide who you are and who you aren’t – and to rediscover that sense of confidence that will make you feel like yourself again. You should rebrand yourself more clearly. Whether you’re running a new business that isn’t going as well as you’d dreamed, or you’re in a new relationship that you fear is directionless, it’s time to get really clear on what’s happening and what the expectations are for the future. Show the world who you are and what you want clearly, and you’ll start receiving what you’re after. It’s time for a money makeover. In 2018, Jupiter is going to visit your house of earned income, making it an exceptional year for you to transform your financial life. Pay off your debt, start saving for retirement, build out an emergency savings fund. In the meantime, ask yourself the hard questions about why you’ve spent so carelessly in the past. It’s time to clean up your act. It’s time to let love in. You’ve been resistant to love in all its forms over the years, and that’s because you have a conflicting doubt that tells you that you aren’t deserving of it (you are). This is the year to shift your self-image… and watch your relationships shift for the better as a result. It’s time to decide what matters and what doesn’t. Whether you have a family member who is ill, a partner who seems to be doing better than you are, or you’re just generally feeling a little bit of stagnancy in your life, this is truly a year for self-discovery. Decide if you really want the raise, or if you think you want the raise because that’s what it means to be “successful.” Some events that will unfold this year (or have unfolded in recent history) will put into perspective what matters… and what doesn’t. It’s time to learn from past mistakes. Thanks to Pluto retrograde in your sign between late April and late September, you will experience transformative change if you do the work to acknowledge your past mistakes. Be honest with yourself about the role you played in spats with family or friends, and be the one to extend the olive branch if needed. You’ll be surprised what you learn about yourself in the process. It’s time to learn to be a team player. If you’re an employer, figure out how to honor or financially support those who are doing the heaviest lifting at your company. If you are in a relationship, figure out how to make your partner feel exceptionally cared for. This is the year for you to realize that no person is an island, and a lot of the success you pride yourself on is actually the result of other people who’ve helped you along the way. It’s time to reignite your creative spark. Life has gotten hectic over the past few years (or months, really). Between travel, new jobs, relationships weaving in and out – it’s been a lot to manage. However, it’s time for you to find yourself again this year, and reconnect with your true passions. Life is meaningless if not for living out what you love. Figure out what that is, and bloom in it once again. This piece was sponsored by Talkspace.